CLEARFIELD – District Attorney William A. Shaw Jr. has announced Clearfield County’s Fugitive of the Week for the week of Aug. 17. Shaw identified the fugitive as Kasey Condon, 24, of Valley View Drive, Clearfield. Condon is wanted for failure to appear at Plea and Sentencing Court held on Aug. 11. On Jan. 30, Officer Julie Curry of the Lawrence Township Police Department filed a criminal complaint against Condon. 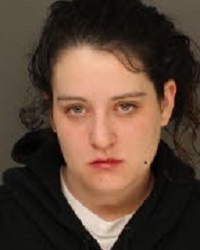 She charged Condon with retail theft, M2, and receiving stolen property, M3. According to the affidavit of probable cause, on Jan. 9, police received a complaint about an alleged theft at a local business the previous day. Upon investigation police determined that a store employee had allegedly witnessed Condon concealing items in her purse. Condon was then allegedly observed paying for several items; however, she did not pay for the items that were concealed within her purse. Condon allegedly refused to stop when confronted by store personnel. A preliminary hearing was scheduled for March 11, at which time all charges were held for court. On Aug. 11, Condon failed to appear at Plea and Sentencing Court, and a warrant was issued for her arrest. Condon is described as a Caucasian female who stands 5 feet, 1-inch tall. She has hazel eyes and brown hair. Anyone with knowledge of Condon’s location is asked to call Clearfield County Crime Stoppers at 800-376-4700. All calls to Crime Stoppers are confidential.